↑ "SIMBAD Astronomical Database". 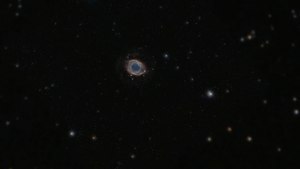 Results for Helix Nebula. Retrieved 2006-12-07. ↑ Harris, Hugh C.; Dahn, Conard C.; Canzian, Blaise; Guetter, Harry H.; et al. (February 2007). "Trigonometric Parallaxes of Central Stars of Planetary Nebulae". The Astronomical Journal. 133 (2): 631–638. arXiv:astro-ph/0611543 Freely accessible. Bibcode:2007AJ....133..631H. doi:10.1086/510348. ↑ O'Dell, C. R.; McCullough, Peter R.; Meixner, Margaret (2004). "Unraveling the Helix Nebula: Its Structure and Knots". The Astronomical Journal. 128 (5): 2339–2356. arXiv:astro-ph/0407556 Freely accessible. Bibcode:2004AJ....128.2339O. doi:10.1086/424621.